The Daily Digress: Ahhhh...Perfect Happiness. There are times in life when I experience great, indescribable joy. Today, ladies and gentlemen, I experienced that joy. 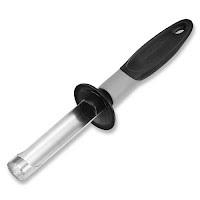 I've finally found the ultimate apple corer, and I didn't even know I was looking for it. It's always annoyed me that it's so hard to remove the core from an apple corer once the apple has been cored. By the way, why do we say "core" an apple when we actually mean "decore"? I guess it's the same as husking corn or pitting cherries. Must be a food thing. The other day, I went to the mall. I don't like the mall, because I do my best to shop local businesses. But my sister had to go to some big box store to get some sort of satellite radio thingy installed in my uncle's BMW and it's rude to order someone else to find someone local to do the job, especially if you once had someone local install some stereo thingy in your BMW and, in the process, they destroyed the air conditioning, which somehow ended up costing you three thousand dollars, but I digress. And tonight I made an apple spice cake, which is far less tedious now that I have my fancy apple corer. In fact, this recipe can now be called easy, so here it is. 1 teaspoon cinnamon or nutmeg, if you're making it for my mother in law, who despises cinnamon. 6 cups peeled, cored(!) and chopped Granny Smith apples. Mix it all together at low speed, just until all the dry ingredients are moistened. If your mixer is almost as old as my husband, which mine is, you may have to use medium speed. Now mix it a little bit more, maybe a minute or two. Let your kids lick the beaters while you stir in a half a cup of chopped walnuts or pecans. Make sure to unplug the mixer before you let your kids lick the beaters. Trust me on that one.